Reprinted from the SpreadLove™ press release. 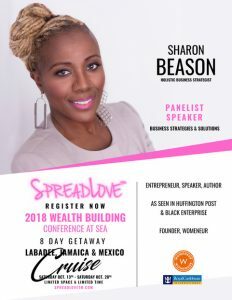 SpreadLove™ announces its 2018 Wealth-Building Conference at Sea, setting sail on October 13, 2018, with a panel of successful female leaders across multiple industries. The mission of this new platform is to support and advance women’s interests through the promotion of financial literacy, self-love, and healthy business and personal relationships. This 8-day event will educate and inform participants about various revenue streams including those derived from entrepreneurship and investing. It will teach them the strategies on branding, attracting your target market, integrating social media, and starting a new business from the ground up. 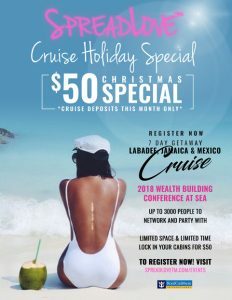 The 2018 Wealth-Building Conference At Sea will be held aboard the luxurious Royal Caribbean International ship Harmony of the Seas from October 13, 2018, to October 20, 2018, departing from Ft. Lauderdale and stopping at Labadee, Haiti; Falmouth, Jamaica; and Cozumel, Mexico. The conference will feature guest speakers, workshops, vendors, and parties with guest DJs. Philanthropy is an important component to SpreadLove’s ongoing efforts. There will be charity-related activities in Haiti at the cruise (more details to come). The keynote speaker will be announced at a future date. Lucinda Cross Otti – Recipient of the Lifetime Achievement Award from President Barack Obama, Best-Selling Author, Founder of Activate Worldwide, Inc., Business Coach and Strategist. Socialize, relax, and have fun! Don’t miss out on early-bird pricing… for the entire month of December, you can reserve your room with ONLY a $50 minimum deposit per person! To learn more and register, visit SpreadLove.com. Women face a multitude of obstacles and struggles daily, from challenges at work and home to body image and relationship issues. SpreadLove features a sounding board for women to discuss and share their solutions. It makes them learn from the experiences the other women. Women deserve a home base for all things WOMEN! SpreadLove is a place to share narratives that are very common and aren’t discussed yet! Join the discussion on “Women in Business and Lifestyle.” To learn more about SpreadLove, go to http://www.spreadlovetm.com. Follow us on Instagram, Facebook, Twitter, and Pinterest. A native New Yorker who resides in Tampa, Florida, Esther JeanBart has been a restaurateur and an entrepreneur in sales, marketing, and real estate for 15 years. She is a successful businesswoman with a vibrant spirit. She launched SpreadLove™ in 2017 to increase meaningful communication between women worldwide. Esther connects with diverse women across the country and the world. She talks with the women who make unheralded contributions to their families, businesses, communities, and grow SpreadLove for all things women. Nnenna Kalu Makanjuola is the founder and editor-in-chief of Nigerian-based Radiant Health Magazine. Nnenna began her health career as a pharmacist. Seeking to make a larger impact, she transitioned to the public health sector. Her public health career spans work at the World Health Organization (WHO) Geneva, U.S. Centers for Disease Control and Prevention (CDC) in Tanzania and Atlanta, and consulting for the Washington D.C.-based Advocates for Youth. She holds a Doctor of Pharmacy (Pharm.D.) degree from Texas Tech University and Master’s in Public Health from Columbia University. Radiant Health Magazine is the healthy living guide for today’s African woman. We began as Nigeria’s first women’s health magazine and have grown globally to reach African women on the continent and across the diaspora as Africa’s leading health magazine. Our mission is to produce high quality, credible and practical Africa-centric health content to guide, inspire and equip our readers to intentionally live healthy, fit and happy lives. My father’s battle with heart disease inspired my business journey. Not only did he have to travel to the U.S. for a life saving heart surgery but upon return we faced many post-care challenges. I especially remember the confusion of putting together a heart healthy Nigerian diet plan for him. We had no guiding resources to do so at the time and over 20 years later it seemed not much has changed. There was still no dedicated source of credible health information tailored for Africans. I had also grown increasingly weary of the ever so bleak African health stories that dominate the media and yearned for a platform where we could tell our own stories. So even though I was on what might appear to be an ideal career path I didn’t feel I was doing the work or making the kind of impact that I set out to do. As I pondered the best the way I could contribute to help improve the health of Nigerians, the idea for Radiant was born. To say I was clueless about magazine publishing is an understatement. I knew zilch about that world so I started off by reading (listening, watching) everything I could about publishing a magazine, entrepreneurship and online business. I would read/learn and apply, test, retool, rinse and repeat. Along the way I met fellow entrepreneurs, coaches, mentors, who have been most invaluable. Yes, Radiant Health is my first business. Prior to striking out on my own I worked as a consultant for the D.C-based Advocate for Youth. Plugging into a community of entrepreneurs who are going through the same journey. Everyone might not be at the same stage but we all understand each what this journey feels like in a way that the people closest to us may not. I worry about not meeting my own expectations. I fear failure. But I also figured the only thing worse is the regret of not trying so I press on. First of all, I’ve learned to let go and sink into the entreblues (as I call it) instead of putting up a fight. Many times, when the thrash of giving up rears its ugly head it’s just your body forcing you to slow down and regroup so you can think clearly about how to attack the obstacles in your way. During this “downtime,” I unplug; I seek out inspiration and motivation from podcasts, books and anything in between; I talk to fellow entrepreneurs and friends; and I rest. The feeling that I’m doing exactly what I want to do at this stage of my life. And I’m doing it on my own terms. I jeopardized my health to launch a health business. Ironic, isn’t it? If I have to do it again, I will, from the get go, prioritize self care and family time over business. Wifi. I can’t do without my high speed internet. Taking time to connect with our readers to understand their needs and also following up with action. In five years I see Radiant as a household name and the number one healthy living destination for every African. 1. Learn. But don’t spend all your time learning. 2. Implement. However imperfectly. It is the only way to move your business forward. 3. Figure out what works for you. Don’t lose yourself in “how it should be done.” Entrepreneurial advice (including this one) is a dime a dozen. If something just isn’t your style, don’t do it. If you want to do things differently, go for it. Pave your own path. In truth, each business is an experiment on its own. On December 6, we reached out to you, our Womeneur tribe on Instagram and asked you what you learned in 2016 in business that you’ll apply to 2017. We are very grateful for all these amazing responses that are definitely actionable and valuable lessons learned for anyone in their personal and business life. Be sure to soak up all 58 of them and apply accordingly! @kreneeward Video Marketing is very effective!! I knew it but I now I am all in !! ??? @estacy_p The need for a VA because I can’t do it all. @miss_kelley2006 Now, that I have the time…make the time for my business to be successful. @cecilesbathandbody Sometimes you have to move backwards to leap forward. resumerenewed Finding what resonates with me and investing in myself. ? Rome was not built in a day. @kibossservices Batching, to do list by project, and being ok on the level I’m on. @gorgeouskhaoshair I learned not to take shortcuts and to not be afraid to be successful and outshine others. @weblyalfred The big Aha! moment for me was to “keep it simple” when you have a lot of information, it’s easy to assume your audience has the same information. In reality they want it short, sweet and simple. They mostly want results from the value you give. Second Aha! moment was that you are the only one who sees that something is not perfect in your business, everyone else’s cares about the value and how it will change their business. @slay_religion Do IT when you think IT. @betterlifechoicesofnewyork I learned that comparison breeds discontentment. No need to believe I am not moving because I’m not moving like someone else is. This patience thing ‘they’ speak of is key! @astepaboveclassy Take my time, study and perfect, don’t rush, don’t have a mixed page via IG or anywhere else, patience, focus and the list goes on. @kathleenstarmer@slay_religion I started doing this, too! It’s a game-changer! @kathleenstarmer My biggest lesson involves the importance of interacting in real life. It’s hard to build a biz strictly via social media when no one knows who you are. In-person interactions, however, are like rocket fuel for your network! ? @_uniquetouch You don’t have to be perfect. Take a time out. Always show up! @veganzingan You get out what you put in. @_prettyrichgirl_Be more prepare when potential clients want what you’re selling & Keep God in All my Businesses !!!!!!!! ? @tamecasays Love the lessons shared. I am reminded to stay focused. No one wants this more than me. @ladyboss_inc Putting God first and Constant development and knowledge update is very important. @betterlifechoicesofnewyork Your friends x family are not your street teams. Limit your expectations and be clear on your definition of support vs theirs. Your friend is your friend, not your promoter. Support varies in form & your business is not their 2nd job. Tough pill to swallow but understanding this saves relationships. @sns_experience Collaboration & Networking are essential to getting exposure. It’s not just about what you know but WHO you know ?? @mmachukwu_omonode Collaboration is the new competition! @kimhyltonTo be myself and not what I think people want to see. That It’s ok to talk about my accomplishments and to not down-play myself when I am in the presence of others who may not be where I am yet. @rr_travels Listen more than you speak. @tvintageglamdc Every morning we start over. We have to be our own cheerleaders and motivators. In 2017, I will not allow people including family and friends to dump their insecurities of what I am doing on me, because when I look closely – they have done nothing – and, don’t want me to do anything. Stepped out on Faith. God is with me always. Moving forward……..
@properexposurebyslc Always, ALWAYS follow my gut and remember that all money is not good money. @graziellalifestyle@evcookiee I learned this the very hard way this year. Not all doors and opportunities are what you think. @graziellalifestyle Synergy is good BUT mind who you synergize with. Not all doors should be walked through and not all opportunities should be taken. Pay myself first. Use the professionals-they exist for a reason. Do it afraid. Partner with God. Educate yourself. Business money and personal money must not mix. @psofnyc Teamwork makes the dream work ? What did you learn in 2016 that you’ll apply to 2017? Malene Barnett is the founder and design director of , a company specializing in handcrafted custom carpets, inspired wall coverings and artisan tiles. Her luxe creations have enlivened premier hotels, iconic office buildings, and sophisticated private spaces. A cultural enthusiast and passionate entrepreneur, Malene collaborates with international artisans. She also avidly shares her business sense with creative entrepreneurs via her e-guide series, public speaking engagements, her Huffington Post and Design Sponge columns, and her interview spotlights in both national and international press, including print, web, TV and radio. Experience her celebrated collection at . We had a chance to find out more about this innovative entrepreneur and her inspiring journey. I’m really big on doing research, especially on the Internet. Before Google was popular, I researched the industry 10 years prior to launching my brand, which I highly recommend to everyone who wants to start a business. In addition, I worked as a contract designer for large manufacturers for more than 10 years, which is how I learned about the rug industry. During my years as a contract designer, I absorbed industry knowledge and developed relationships with industry professionals. In addition to overseeing the logistics of registering my business, I also invested in a branding consultant to help clarify my brand mission. Then, I developed a collection of designs, sourced manufacturers, identified my target market and signed up for my first trade show to launch my collection. Before starting Malene B, I was the lead designer and marketing manager for a textile manufacturer. Then I was hired as a carpet designer for a rug manufacturer. I learned early on that the idea of working full-time for a company didn’t fit with the flexible lifestyle that I wanted. So I quit my full-time job, traveled to Southeast Asia for three months and returned as a contract designer for home textile manufacturers. I designed textiles and rugs for many companies and designer brands, including: Nicole Miller, Martha Stewart, Karastan, Marcus Fabric and Liz Claiborne. The collections I designed were distributed in major retail stores such as Macy’s, Bed Bath & Beyond and JC Penney. This experience was my first entry into entrepreneurship because I had to manage my own schedule and constantly juggle multiple projects to keep my income flowing. I’ve had many businesses that involved selling my art, but I consider Malene B my first formal business. A few years before I launched Malene B, [bctt tweet=”I invested in a branding consultant to help identify my brand mission via @malenebcarpets” username=”womeneur”]. Once the mission was clear, it helped me to make informed decisions on how I wanted to grow the business. I have a brand blueprint that I still refer to 10 years later. My biggest business ownership fears are not being able to take care of myself financially. Entrepreneurship has its ups and downs and so does cash flow. However, I understand that this is part of the journey, and I don’t allow it to dictate my well-being. I face the fear head-on, and accept that it’s normal and simply a part of the entrepreneurial process. I think about the bigger picture of what I really want to accomplish. Having a social media following is also helpful because on the days when I feel like giving up, a comment from a social media fan helps me to refocus and reminds me of the purpose of my business. I know that my business is about the people I serve, and with this understanding, I do my best to fulfill those needs. The most rewarding part of being an entrepreneur is being able to provide people with products that make their lives and homes meaningful. I wish I didn’t have to juggle so many roles. But I believe that if I weren’t able to handle everything, then the opportunities wouldn’t be coming my way. I would hire a full-time assistant to help manage the business. In the beginning, it’s hard to hire people when finances are tight, but I do see the value in having someone to assist you with the day-to-day operations. But I also believe that every business decision I’ve made has and continues to shape my business, and I needed to experience everything I’ve gone through in order to determine my next move. There’s no secret to it! Just be transparent and real with your customers. That is how I live my life, so I don’t do anything differently with my clients. Remember that you can choose the people you want to work with, and that not everybody is (or has to be) your customer. I see my business based somewhere in the Caribbean. I also see multiple product categories that will expand my brand into a lifestyle company with a global reach. In addition to products, I also foresee spaces that embody the Malene B lifestyle. Buy property before you start your business. Invest in an accounting software to track your sales. Be true to yourself, know your purpose and don’t be easily swayed. has been named a global leader for the next generation. She’s an international speaker, author and creator of The Happy Conference. She earned her bachelor’s degree in paralegal studies from College of Saint Mary and her master’s degree in human resources from Loyola University Chicago. Stacey is a partner at Ambassadors Worship Center in Omaha, Nebraska and happy mother to her son Rakim. We had a chance to catch up with this Womeneur to learn about her entrepreneur journey. My mom inspired me, she was always an entrepreneur. Growing up, I was able to observe wealth flowing into our house whenever my mom had her own company. I wanted to figure out how to do that for my son and I; I always wanted to be wealthy so I saw that as the best way to go about it. I was always creating businesses when I was young. For my first company, Styles by Stacey, I would do hair for prom, homecoming and school dances. My first high profile client was my pastor’s wife; I would do her hair for church on Sundays. When I started my speaking business, I first had to close down my HR consulting firm. I was good at consulting but not gifted to do it. Then, I started speaking and asking people to pay me to speak. Finally, I hired a speaking coach to help hone my speaking skills. I did everything he told to do in regards to creating a strong speaking company. Before speaking I had an HR consulting firm, we designed and delivered leadership training programs to fortune 500 companies. Hiring a speaking coach really helped me to transition into speaking. Entrepreneurship is audacious in itself. So once I stepped into it I had to come to peace with that, so I can’t say I really have business fears. I listen to Beyonce. Beyonce is a big motivator for me because I believe she balances her purpose and her life really well and this is what I strive to attain. I’ll also go over my vision boards or journals when I have time. Tracking my progress, going back to where I was and look at what I’ve grown into now; looking at what I’ve come from and where I want to be motivates me to keep doing the work. Being able to involve my family in my business. Business ownership gives me the flexibility to incorporate my family’s input, gifts, thoughts and views. My son used to say, “Mom you’re the happiness queen” and that evolved into me being the Ambassador of Happiness. He also gives me input on my social media platforms, my mom styles me and my niece can take my social media pictures! Financial overhead. Managing the financial overhead is the least enjoyable part. I wish I could just do the creative side, but managing the financial side is a must and is really taxing. I would have hired an assistant sooner! I always try to deliver a wow factor. And now that I have an assistant I really try to make sure my clients are touched and responded to more quickly. They receive immediate response and follow up so they know I value their requests and reach them sooner with my assistant. I see my business as an international full service speaking, coaching and consulting firm. I will also continue to inspire people globally from the stage at The Happy Conference. I will train people to life coach based on my signature coaching program and consult worldwide to make happier workplaces all over the globe. Having one talent doesn’t mean that you have a business; doing hair and owning a salon are 2 different things. Where you don’t have money you need relationships. Happiness comes before success; until you’re happy with your company/work you won’t find success.